← How to convert HTML to PDF and encrypt created PDF? The application to be introduced in this article is an OCR application which can recognize six kinds of languages from image PDF document, including English, French, German, Italian, Spanish and Portuguese. It also has the ability to convert the image PDF to XLS or XLSX format file. 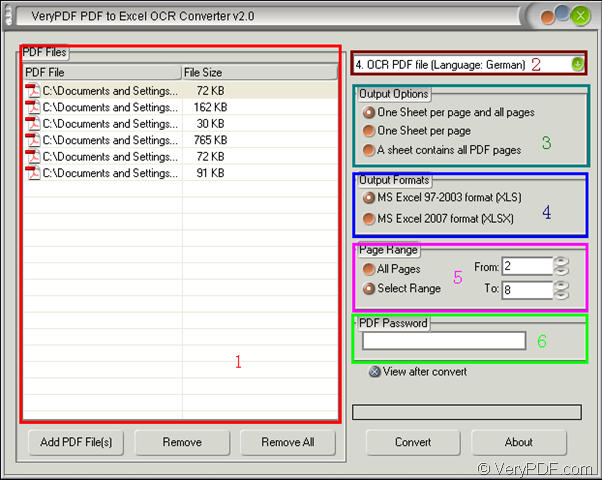 The name of the application is VeryPDF PDF to Excel OCR Converter. 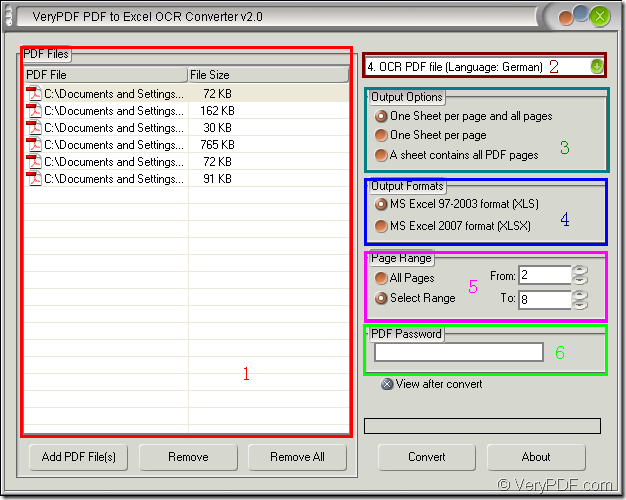 Please see the main interface of PDF to Excel OCR Converter in Figure 1. This is a clear and friendly interface which is easy to be understood. There are six main parts in this interface which are for different usages. The following contents will describe them for you specially. 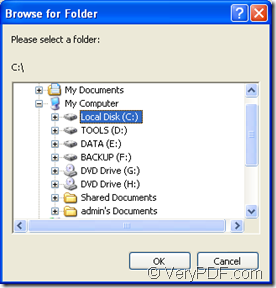 Click “Add PDF File (s)” button below the file list to open file picker window from which you can choose the documents you need. 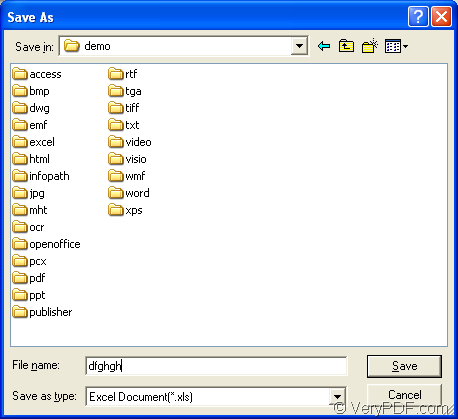 Right click the file list and click “Add files” option in floating item and then choose documents in popup file picker window. Drag and drop the files into file list directly. Part 2. Top right dropdown list. In this dropdown list, there are seven options for your choice. The first one is to convert PDF to XLS without using OCR tech, which aims at the common PDF documents. The options from 2 to 7 are specific to image PDF documents. Sixe kinds of languages are all available when you choose any one of them. If you want to convert the content in German PDF document to XLS file, please select the forth option: OCR PDF file (Language: German). Part 3. Output Options group box. Three kinds of output layouts can all play their roles when you check any one of them. You can convert all PDF pages to one sheet XLS or one PDF page to one XLS sheet by choosing the option “A sheet contains all PDF pages” or “One sheet per page” option. You can also combine these two situations as one by checking the option “One sheet per page and all pages”. Part 4. Output Formats group box. To convert image PDF to XLS format, you need to choose “MS Excel 97-2003 format (XLS)” option in this dialog box. Part 5. Page Range group box. When you check “All Pages” option, you will convert all pages of input document to XLS file. If you check “Select Range” option, the edit boxes “From” and “To” will be activated and you are able to input start and end page number to convert specified pages to XLS file. Part 6. PDF Password edit box. If the input image PDF is an encrypted one and if you want to convert this document, please input its open password in this edit box. Then please click “Convert” button to open “Save as” dialog box which is for saving one XLS file or “Browse for folder” dialog box which is for saving batch files batch. 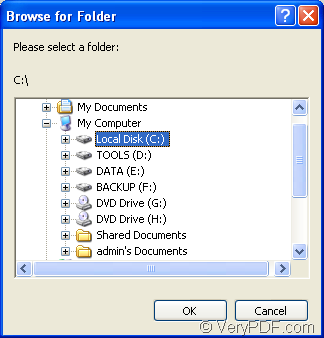 Please see “Save as” dialog box in Figure 2 and “Browse for folder” window in Figure 3. You need to click “Save” button or “OK” button to run the conversion from image PDF to XLS. To download or purchase PDF to Excel OCR Converter, please enter its homepage. This entry was posted in OCR Products and tagged German PDF, image PDF to XLS. Bookmark the permalink.